In other news, we finally have power in our garage. 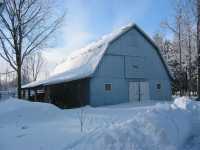 Not sure if I mentioned it in the blog, but around February, the garage lights and outlets started misbehaving, and it turned out we had a problem with the underground wires buried between the barn and the garage. We had to wait for a thaw to get at the cables, and then we had to get the schedules lined up between us and the electrician, and then we had torrential rains when they were supposed to come (no digging in the flood), then they had a big job scheduled, then they found a bee's nest in between the barn walls (had to call pest control to get rid of them), but in the end, today they were able to show up and finish the job. And now we have power in the garage. It's about time, it's been half a year now... Of course it's a lot more important to have power in the garage in the winter, to have the lights come on when we get home from work, and to be able to plug in the block heaters. Next time, there will be some pictures, I promise. I just discovered that our camera batteries are completely drained, but as soon as they are recharged, I will go trigger happy!